Roscoe Pretlow of Chesapeake Va won the scratch division and took home $2400 and Samantha Russell of Delaware won the Handicap Division for $2400 of the $32,000.00 Scholarship Prize fund. Congratulations to the winners of this years Danny Wiseman Youth Scholarship Tournament presented by Charis Contractors LLC. The Youth Athletes that competed in this years event came from Maryland and many surrounding states including North Carolina,Georgia and DC. 1in 4 cashed and all 32 in each division plus down to 41st in scratch and 36th in the handicap division cashed. For the second year in a row Michael Mirabile of Long Island NY took home the high 15 game block prize of $300.00 for those who competed in all 3 squads. In the Handicap Division MarIbeth Baker took home the $200 additional Prize for high 15 game total. Thank you to the presenting Sponsor again for this year, Mr. Dave Wandel owner of Charis Contractors LLC. Please express your thanks by dropping Dave a email or message on Facebook as well as the many other sponsors of whom are on Facebook. 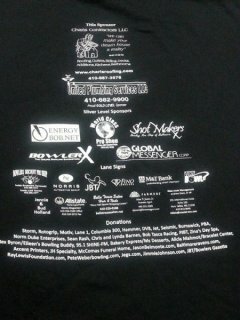 All sponsors were in the youth bowlers event brochure they received also. Let them know how much they are appreciated. This helps in every way for next years event!! My Heartfelt thanks goes out to ALL the event Sponsors as this would not have been possible without your continued support of my efforts to have these youth bowlers compete for the scholarship monies they do. Thank you All ! A huge thank you to the volunteers who helped all day and the PJBT crew- Matt and Josh who work like a well oiled machine and Stacey for taking care of the entry submissions this year ! Their tournament running experience is second to none. Thank you so very much! I also want to thank the many folks who helped in the selling of the “Chance” auction tickets throughout the day Saturday and Sunday. The auction generated $4110.00 additional money for the youth bowlers prize fund ! Thank you to AMF Country Club for hosting again this year as I greatly appreciate your being the host center for the weekend ! Great job to Deon Koon and his staff and to District Manager Shirley Pierpont. A special thank you to all the parents who continue to Love,support and encourage their Youth Bowlers to compete !! Another great year and two fantastic days of competition. I can't thank everyone enough for great weekend of bowling for the 7th year of this event! If anyone has and suggestions please drop me a message or email me. Until next year I wish all the youth bowlers much success in their future bowling BUT most importantly their success in school or college studies ! God Bless ! 2017 Danny Wiseman Youth Scholarship Tournament Champions! Tom Hankey Jr of Massachusetts. won scratch division and took home $2000 and Jarrett Billings of Delaware won the Handicap Division for $2000 ! The full breakdown of the prize list is posted and also in the facebook group page. 306 Entrants competed on Saturday Oct 8th in three squads and the top 32 finalists competed on Sunday Oct 9th in the double elimination 2 game bracket elimination finals for the $28,300.00 Prize fund. With the brackets,eliminator,winner take all, Friday sweepers the total payout was $31,039.00 !!! The Youth Athletes that competed in this years event came from 8 surrounding states and DC. 1in 4 cashed and all 32 in each division plus down to 38th in each division cashed for the tournament. Michael Mirabile of Long Island NY who finished 3rd in scratch took home the high 15 game block prize of $300.00 for those who competed in all 3 squads. In the Handicap Division Tommy Sanfilippo of NJ took home the $150 additional Prize for high 15 game total. I also want to thank the many folks who helped in the selling of the “Chance” auction tickets throughout the day Saturday and Sunday. The auction generated $3600.00 additional money for the youth bowlers prize fund ! Thank you to AMF Country Club for hosting again this year as I greatly appreciate your being the host center for the weekend ! A special thank you to all the parents who continue to Love,support and encourage their Youth Bowlers to compete !! Another great year and two fantastic days of competition. I can't thank everyone enough for great weekend of bowling for the 6th year of this event! If anyone has and suggestions please drop me a message or email me. Until next year I wish all the youth bowlers much success in their future bowling BUT most importantly their success in school or college studies ! God Bless ! Thank you to everyone who participated and Congrats to all the winners! 360 tickets were sold ! $3600.00 extra contributed to the youth bowlers prize fund ! 2016 Danny Wiseman Youth Scholarship Champions ! Congratulations to the winners of this years Danny Wiseman Youth Scholarship Tournament presented by Charis Contractors LLC. Ryan Graham of Lancaster Pa. won scratch division and took home $2000 and Andrew Thorne Jr of Washington DC won the Handicap Division for $1500!! The full breakdown of the prize list is posted and also in the facebook group page. A full field of 240 competed on Saturday Oct 8th in three squads and the top 32 finalists competed on Sunday Oct 9th in the double elimination 2 game bracket elimination finals for the $23,540.00 Prize fund. With the brackets,eliminator,winner take all, Friday sweepers the total payout was $25,591.00 !!! The Youth Athletes that competed in this years event came from 8 surrounding states and DC. 1in 4 cashed and all 32 in each division plus 33th and 34th in scratch cashed.Jarrett DeFalco who finished 3rd in scratch took home the high 15 game block prize of $350.00 for those who competed in all 3 squads. Thank you to Dave Wandel owner of Charis Contractors LLC for being the presenting sponsor again this year. Please express your thanks by dropping Dave a email or message as well as the many other sponsors that were in the youth bowlers event brochure they received. Let them know how much they are appreciated.This helps in every way for next years event. My Heartfelt thanks goes out to ALL the event Sponsors as this would not have been possible without your continued support of my efforts to have these youth bowlers compete for the scholarship monies they do.Thank you All ! A huge thank you to the volunteers who helped all day and the PJBT crew- Matt, Brittney and Josh who work like a well oiled machine ! Their tournament running experience is second to none. Thank you ! 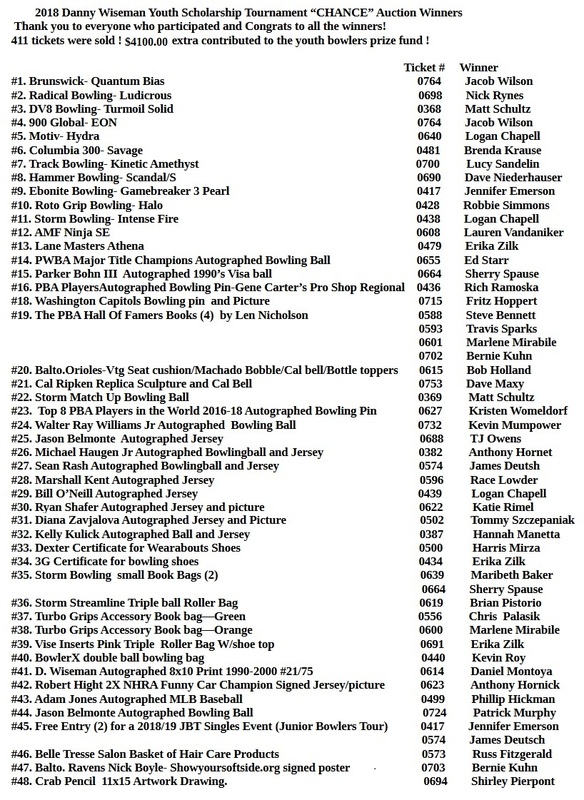 I also want to thank the many folks who helped in the selling of the Cal Ripken Jr. Autographed Baltimore Oriole bowling ball which generated $2k. The winner of the Ball was Richard Lee of Bel Air Md.and it was drawn by Andrew Lazarchick who bowled the 1st 300 in 5 years of my event this year ! Congrats Andrew ! A special thank you to all the parents who continue to Love,support and encourage their Youth Bowlers to compete !! Another great year and two fantastic days of competition. I can't thank everyone enough for great weekend of bowling for the 5th year of this event! If anyone has and suggestions please drop me a message or email me. Until next year I wish all the youth bowlers much success in their future bowling BUT most importantly their success in school or college studies ! God Bless ! The Winner of the Cal Ripken Jr Autographed Bowling Ball was Richard Lee. The winning ticket was drawn after the 4th Bracket finals match by Youth Bowler Andrew Lazarchick of NJ who had earlier bowled the first ever 300 game in 5 years of my Tournament. This ball raised an additional $2000.00 for the youth scholarship tournament that was this past Sunday. All 400 tickets were sold over the summer and at the event and a huge thank you to those who helped in selling these tickets ! This was a limited edition Baltimore Orioles Bowling ball donated by ontheballbowling.com in which I had Cal Autograph through reaching out to his Sister Elly. Congrats Richard as you own a one of a kind autographed Cal Ripken Jr autographed bowling ball ! Congratulations to Conner Kolessides who won scratch division and took home $1750 and to Tommy Sanfilippo who won the Handicap Division for $2000! A full field of 152 competed on Sunday Oct 11th 2015 for the $22,355.00 Prize fund (not including brackets,elminiators,winner take all and high girls). Thank you to Dave Wandel owner of Charis Contractors LLC for being the presenting sponsor again this year. Pictured is Mat from the PJBT, myself, Conner, Tommy, and Dave ! The Youth Athletes that competed in this years event came from 8 surround states and DC. 1 in 3 cashed this year! Many thanks goes out to ALL the event Sponsors as this would not have been possible without your continued support of my efforts to have these youth bowlers compete for the scholarship monies they do. A huge thank you to the volunteers who helped all day and the PJBT crew- Matt, Travis, Jenn,Brittney and Josh. ! Thanks to AMF Country Club for hosting again ! A special thank you to all the parents who continue to support and encourage their Youth Bowlers !! A fantastic day all around for everyone and I can't thank everyone enough for great weekend of bowling! Total Payout of just the tournament. $22,355.00. I'll be posting the final files in the group page .Total with all included for the payout is $24,259.00 !!!! Winners of the 2014 Danny Wiseman Youth Scholarship Tournament presented by Charis Contractors LLC 10-12-14 - Pictured is Dave owner of Charis, myself, Adam, Brianna and Matt from the PJBT. 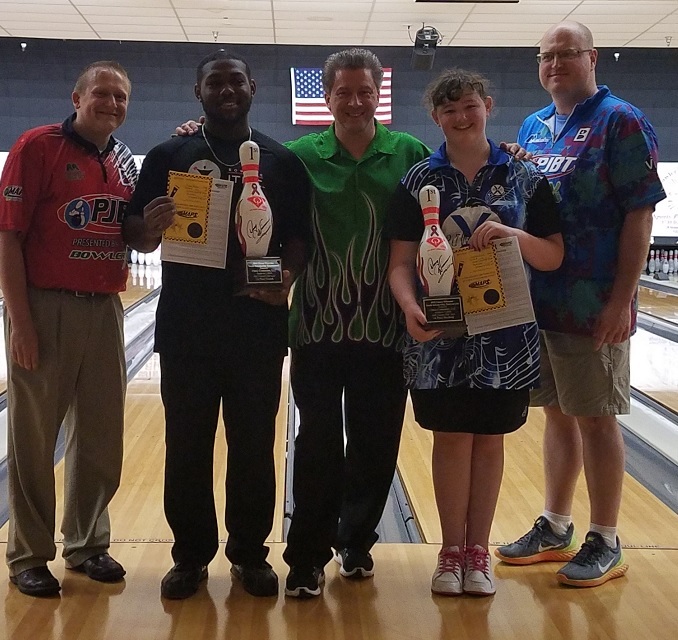 Congrats to Brianna Marie Barna & Adam Zimmerman & for taking home the titles! Over $21,000 in scholarships including $19,310 to 66 different competing bowlers (1 in 2.5 ratio for the finalists 26 - 40 handicap) and over $2,000 in side pots/brackets etc. A full field of 160 Youth Athletes competed in this years event from 8 surrounding staes and DC. Many thanks goes out to ALL the event Sponsors as this would not have been possible without your continued support of my efforts to have these youth bowlers compete for the scholarship monies they do. A huge thank you to the volunteers who helped all day and the PJBT crew - Matt, Travis, Jenn, and Josh. ! Thanks to AMF Country Club for hosting again ! A special thank you to all the parents who continue to support and encourage their Youth Bowlers !! A fantastic day all around for everyone ! Pictures from the 2014 DW Scholarship event Oct 12th 2014 --you may have to be signed on to facebook and ask to join the group. THE WINNER OF THE RAY LEWIS BOWLING BALL WAS SET SETTINO !! This ball raised an additional $1250.00 for the youth scholarship tournament oct 12th !! All tickets were sold ! A limited edition Baltimore Ravens Super bowl Bowling ball donated by ontheballbowling.com in which I had Ray Lewis Autograph June 13th 2014 for my Scholarship Youth tournament. There will be tickets available to purchase at $5.00 each (Email me if interested by clicking contact us) and the ball will be raffled off after the youth qualifying oct 12th. Only 200 of these balls were made and only this one is signed by Ravens legend Ray Lewis. 3 Months out for the Youth Scholarship Tournament. Signage is up for the event and for the presenting sponsor Charis Contractors LLC. Pictures up on Facebook for the 2013 DW Junior Scholarship Tournament...Check out the great turnout again for this years event! Thanks to all those involved and look forward to next years event ! Another great turnout with a full field of 140 youth bowlers for this years Danny Wiseman Junior scholarship tournament. Payouts exceeded over $13,000 this year with the scratch division winner Brian Gaines of Philadelphia winning 1000.00 for 1st place. 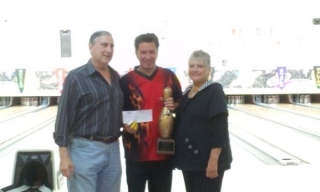 In the handicap division James Norris III of Waldorf, Md took home 1100.00 for first . All of the second round match play finalists received monies for their SMART accounts this year in both divisions. A huge thank you to our title sponsor, Charis Contractors LLC and the many other contributing sponsors and donators involved this year !!! An awesome day of fun and excitement had by all ! Thanks to all who traveled from the many surrounding states for attending ! 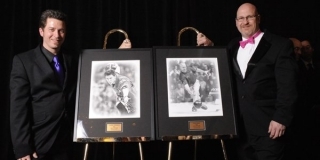 I am honored and thankful and hope you had a great time ! Pictures will be up soon as well as the standing sheets. Final Matches in the years Danny Wiseman Junior Scholarship Tournament presented by Charis Contractors LLC. 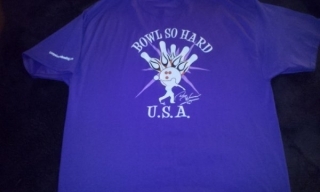 Since my induction into the PBA Hall of Fame will be forth coming in March in Indy I decided for the fans out there to put on ebay a new limited edition DW "Bowl so Hard" USA t-shirt. (only 35 left ! )..check it out ... Thanks for all the congrats ! Very proud and humbled to be joining the greats of Bowling ! ! Visit my ebay store store and you will find shirts that differ then here on the website, TOUR USED bowling balls, patches, vintage bowling magazines and other items that will be added throughout the summer ! If your an ebay member please add me to your favorite sellers list !Link for my shirts is here or click the red headline for my store..
Just click the Facebook icon to be directed to my fan page or or click the red link. I have a facebook page full of info, pics, wall stuff etc and my bowling stuff. Hit the "LIKE" page and send to all your bowling friends! We are now working on starting to plan for the 2013 event because of the great success we had for the first event Oct 14th 2012. We had a fantastic turnout and great participation from youth bowlers from the surrounding states. I thank everyone who participated and thank all the parents for supporting their children's love of our sport and encouraging their desire to compete!! Congratulations to Layne Sandt (scratch) and Tony Mai (hdcp) for winning their respective divisions in the first Danny Wiseman Junior Scholarship Tournament today at AMF Country Club Lanes. A fantastic turnout and great competition in both divisions ! 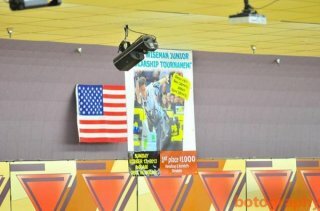 Pics will be up HERE and the winners of the Bowling ball raffles etc are listed on this site. 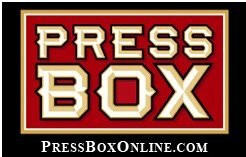 2012-13 PBA Tour schedule info by clicking the link! I'll be bowling the WSOB in Detroit as well as the Major events in the USA. Inside Pressbox Interview with Stan "the fan" Charles July 1,2012 on recent regional titles,bowling and on my Youth event in Oct.
#8 Danny Wiseman, Baltimore, Md., def. #11 Tommy Dakouvanos, Belford, N.J., 1-0 (267-200). #8 Danny Wiseman, Baltimore, Md., def. #5 Darryl Bower, Middletown, Pa., 1-0 (246-203). #8 Danny Wiseman, Baltimore, Md., def. #16 Tommy Gollick, Oberlin, Pa., 2-0 (279-191, 265-215).